Movie Review: 'Blessed Is The Match' - A Story of Resistance Illuminated Director Roberta Grossman sketches a portrait of Hannah Senesh, a Hungarian-born woman living in Palestine who trained as a paratrooper and returned to her homeland to organize resistance to the Nazis. Walking through history: Hannah Senesh (Meri Roth, right) helped to liberate Hungarian Jews during World War II. Not rated: Images and writings from Holocaust survivors — and from those whose lives it claimed. Farewell to a friend: Senesh parts with her mother in Blessed Is The Match. To look at the story of the Holocaust as told by Hollywood through the years, you might never guess there were Jews who fought back against the Nazis. Brutalized victimhood has mostly been the assigned role of Eastern European Jewry. 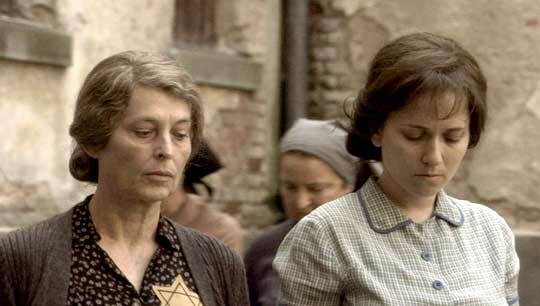 But this winter, Jewish heroism has been decently represented at the cineplex. First, Edward Zwick's drama Defiance brought audiences a lightly fictionalized account of the Bielski Partisans, who managed to hide more than 1,000 Jews from the Nazis for several years in Belarus. And now Roberta Grossman's Blessed is the Match: The Life and Death of Hannah Senesh offers a documentary portrait of a Hungarian woman's journey from poet-diarist to Zionist to paratrooper to resistance fighter. Grossman, a writer and producer of television documentaries, has a robust story to tell, and she's found remarkable World War II footage — harrowing images of the Warsaw ghetto, vivid kibbutz training films — to help her tell it. Also photos of the title character and her family, to complement the talking heads who narrate Hannah's story. And where those images can't bridge narrative gaps, she employs actors, often with cross-fades from their re-enactments to nearly identical black-and-white images of the real-life participants. Yes, there's something vaguely unsettling about this device, which introduces demonstrably fabricated images into a true story that doesn't require them. But it proves a decently effective way for the director to guide us from Hannah's happy youth through her growing awareness of her separateness, as Hungarian society began to ghettoize Jews, to her Zionist flowering, her migration to Palestine and her subsequent return to Hungary to help her mother and other Jews escape. That Hannah was captured when she returned from Palestine is more or less telegraphed by the film's title; even if it weren't, the sight in the film's early moments of her coffin being brought back to the newly created state of Israel in 1950 erases any doubt about her fate. Still, even that sort of visual overreaching springs from a poetic impulse at the film's heart — the title is drawn from a verse Hannah wrote just before she was captured — and that impulse is enough to sustain audience interest.